Bengaluru/New Delhi: They are everywhere. Drive into New Delhi’s Sarita Vihar from satellite city of Noida and it stares at you like a giant eye from a hoarding. It is a permanent fixture at your kirana store or neighbourhood deli. Flip through Prime Minister Narendra Modi’s new book Exam Warriors and it warmly sits next to the images. The simple quick response, or QR code, once relegated to the sidelines, is back with a bang. “At one point, even I wasn’t sure. But it’s everywhere now," says Pratyush Prasanna, head of products at Poynt, a company selling smart point of sale (PoS) devices. QR codes are machine readable labels that can carry different kinds of information ranging from product information to account details to virtually anything. Think of QR codes as super barcodes—they can be read 10 times faster than barcodes and are rapidly gaining custom in an era of smartphones. In late 2014, Prasanna had run some experiments with QR codes in Bengaluru for Paytm, when he was a vice-president of business and products at the mobile payments platform. It was ahead of its time then and didn’t see a lot of uptake, he says. Fast forward to 2018 and millions of QR codes have sprung up across the country and experts say it is only the beginning. Textbooks in four states—Tamil Nadu, Andhra Pradesh, Maharashtra and Rajasthan—will soon have these codes. Over five million merchants on Paytm, its nearest competitor MobiKwik’s two million merchants, and over 75,000 sellers on Paytm Mall have QR codes on display. An aggressive MobiKwik wants to touch the 10-million mark, Paytm Mall wants to put QR codes in three-four times as many the number of stores, and then there’s the government pushing the use of QR codes using the interoperable payments solution BharatQR (last October, it was halfway to its target of 1.5 million shops by this March). In September 2017, payments provider Visa and BillDesk announced that users will be able to scan QR codes at nearly 50 large service providers potentially reaching 300 million consumers. Besides payments, other large scale QR deployments include the Aadhaar identity project, ticketing, media ads, brand engagements and product packaging. QR codes first appeared in Japan in the mid-nineties. It wasn’t until the late Noughties that the technology took off in Japan. Until then, they were primarily used in the automotive industry to keep track of components. These codes are made up of black and white squares arranged on a square grid and a white background. It can store information such as numbers, alphabets, bytes and the Japanese Kanji characters in the form of patterns and is easily readable by cameras. The tech never found many takers because QR code readers weren’t freely available. But then, mobile phones with good cameras became the norm and these codes became useful again. Recently, it found its killer use case in India: payments. In a post-demonetization India, QR codes have offered customers and merchants the path of least resistance to digital modes of payments. Especially given that it more or less coincided with the rapid growth of Reliance Jio, which has rapidly increased the spread of data use and smartphones in India—some 20 million devices are being added every month to a smartphone population of more than 300 million as of last financial year. It’s not just in the large cities that QR codes have had an impact. Harsha Halvi, a college goer from Kalaburagi, formerly Gulbarga, some 600km north of Bengaluru, says he prefers to pay through his mobile phone. “I use mobile payments wherever I can because here in Gulbarga the ATMs run out of cash very often," says Halvi on phone. Grocers and medical shops have QR codes to accept payments, says the final year BCA student of Gulbarga University. Many of his peers—he’s 21—use Paytm but he points out it’s yet to be popular among older people in his town. India is only tracking the big QR lift-off that first happened in China. According to one estimate, QR code enabled $1.65 trillion worth of mobile payments in China in 2016. Tencent and Alipay, the biggest payments companies in China, are the biggest drivers of QR codes in China. There have been reports of the code being used to tip waiters in restaurants and even give alms to beggars. As The Economist explains, these codes took off in Asia first and is now ready to spread to America and Europe. An article in the Wall Street Journal goes on to say that the cashless society has already arrived—only, it’s in China. 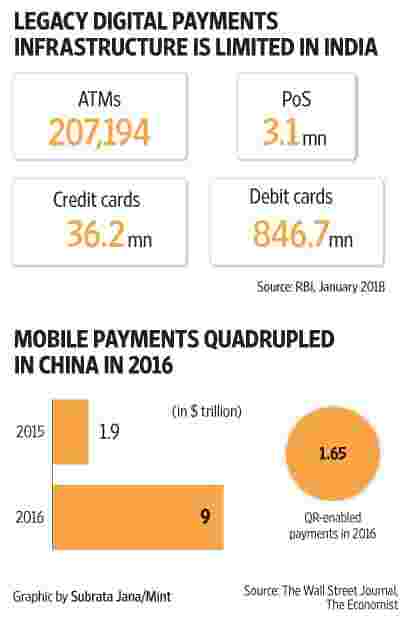 Mobile payments totalled $9 trillion in China the year before, growing nearly four times from 2015 to 2016, whereas people chose to spend $10 trillion in cash in 2016, down about 10% in two years. In India, the revival of QR code is mostly being driven by payment companies and the government. They’re easy to deploy, cost a fraction when compared to setting up a point of sale (PoS) terminal, and is easy for users. Which is why companies like Paytm Mall are betting heavily on it. “Elegance is always in simplicity. QR Code as an interface between the offline and online world is amazing. It just converts the offline traffic online and that’s why there’s a revival," says Amit Sinha, chief operating officer at Paytm Mall. A QR code-based transaction is simple and takes only five-seven seconds whereas card-based payments take much longer, says Upasana Taku, MobiKwik’s co-founder. Other systems like near-field communications-based (better known as NFC) payments are faster but the feature is available only on expensive smartphones and merchants need to upgrade their PoS devices—and hence may not find mass adoption. Moreover, PoS device penetration is low in India. “How do you pay using debit cards and PoS machines? There aren’t enough of those," says Taku. According to January 2018 data from the Reserve Bank of India, India has just 3.06 million PoS devices to process payments made on the nearly 36 million credit cards and some 847 million debit cards issued. Milk booths, paan shops or kirana stores found in every neighbourhood, can’t afford a PoS device because they sell mostly low-value items. A QR code is ideal in these places. “As far as payments are concerned, QR is the cheapest," says Deepak Abbot, senior vice-president at Alibaba-backed Paytm. The company is also working on interoperable QR codes that will not only work on Paytm but also other apps. “You just need to print a PDF and you get a unique QR code for the merchant," says Taku. It costs less than $2 to put up a laminated QR code sign at a shop. In contrast, merchants usually end up paying a setup cost—ranging from free to a few thousand rupees—or rent to the service provider and commissions on transactions. QR code payments are cheaper by at least 10 basis points than card-based payments. According to RBI, debit card transactions are allowed 0.4%-0.9% commissions while QR code-based payments charge between 0.3% and 0.8%. Commissions on credit card transactions range from 1% to 3% depending on the cards used. For QR codes to take off, two factors are important: smartphones and bank accounts tied to mobile phones. “It’s the overwhelming adoption of mobile payments in China that has enabled so much," says Jeffrey Towson, private equity investor and professor at Peking University in Beijing in an email interview. Mobile payments have become so prevalent in China such that smaller vendors will not accept cash, points out Towson. Cash even looks a little strange in places like McDonalds, where everyone uses their phone, he said. “The other thing to think about is almost everyone in China has a bank account. Most mobile payments are tied to bank accounts. That helps too." Both smartphone penetration and mobile-linked bank accounts are on the rise in India. India is expected to end 2018 with 530 million smartphone users. The government claims that more than 310 million new deposit accounts have been opened since August 2014 under the Pradhan Mantri Jan Dhan Yojana (PMJDY). It also said that 99.99% of the 212.2 million Indian households surveyed now have a bank account (although 14% of the households were not included in the survey). India is at the centre of a digital payments revolution, partly due to the implementation of the Unified Payments Interface, or UPI, a set of protocols that allow instant money transfer between bank accounts. Companies such as Google, Amazon, WhatsApp, PhonePe, Paytm and a clutch of others have launched UPI-based payments already. Google’s payment app Tez, also uses audio QR codes where information is transmitted in the form of audio instead of an image. Volume of UPI transactions grew seven times to 145.5 million between August and December last year. While QR codes are set to become a dominant force in the payments business, it is unlikely to cannibalise other forms of payment. “Payment mechanisms never go away. Credit cards, debit cards, barter, cash they still exist. Credit/debit card usage in China has decreased in percentage terms but increased in absolute terms," says Poynt’s Prasanna. Smart PoS devices will replace dumb ones, he says. “We are in very early days of retail digital payments—and QR codes are a good first step," says Sanjay Swamy, a partner at Prime Venture Partners, an early stage venture capital fund with a focus on fintech start-ups. Static QR codes will give way to interoperable QR codes with BharatQR as a common standard, he said. Earlier this year, Prime-backed Ezetap launched a smart PoS device that accepts various payment instruments including QR code-based payments. Users can simply scan the QR code displayed at the merchant using their banking app and pay for goods or services. It was launched in February 2017 and by September, 30 banking apps had launched this feature and nearly 400,000 merchants were onboard the BharatQR system. Imtiaz Ali, manager at Kolkata Famous Kati Rolls, in Murugeshpalya, Bengaluru says Rs1,000-1,200 a day gets transacted at his eatery every day via Paytm. “Our overall business has not grown much but lots of young people from the software sector prefer to pay using it," he says in Hindi pointing to the Paytm QR code display card on his counter. “It’s really easy if you have the Paytm app on your phone." Jai Borah, who works at Rolls on Wheels in Bengaluru’s R T Nagar, says customers are primarily drawn to digital payments because of cashbacks. To be sure, even a solution as simple as static QR codes come with vulnerabilities and odd situations. Criminals can stick their own QR codes on top or legitimate codes to swindle money from unsuspecting users—as has been happening in China. The problem seems to be gaining attention. In an opinion piece, state-run China Daily said companies providing QR code-based solutions should take responsibility for the security of transactions. Dynamically generated QR codes can solve this problem but require a smart PoS device. App developers can also encrypt QR codes so that it is readable only in their application. FactorDaily counts Paytm founder Vijay Shekhar Sharma as one of its investors.